Neelam Waldia did her schooling from various KV in different parts of the country. She is a science Graduate & did MBA from Army Institute of Management Kolkata in Marketing & HR. 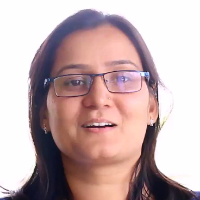 She has been working as a HR Manager and have total 10 years of experience in various verticals of Industry. Human Resource Management is managing the most crucial resource of an organisation, which is- People is known as the Human Resource Management. Machines, buildings, brands etc, everything diminishes except for people who increase in terms of value. The role of HR begins from recruiting, training, evaluating, motivating, retaining, managing conflicts and when required taking tough decisions on people. "After completing my schooling, I gradated in science stream and did my MBA I Hr & Marketing from Army Institute of Management Kolkata. I am working as a HR Manager and have total 10 years of experience in this field."